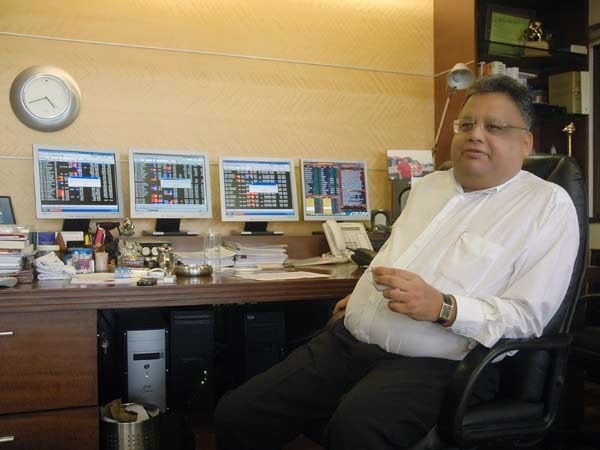 Many won't believe that Rakesh Jhunjhunwala, the so called Warren Buffet of India, has given more misses than hits and any average investor who would have copied his moves since past 5 years should be sitting on huge losses. Making money in Indian markets have become increasingly tough and that to if a portfolio is largely skewed towards midcap then there is no stopping to the pain. Some of the midcaps that the big bull was heavily bullish on has crashed more than 90% from their highs of 2008. 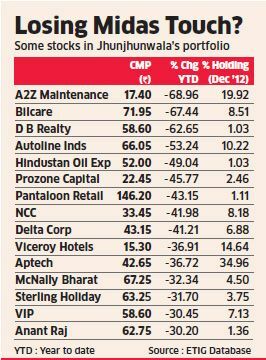 For instance A2Z maintenance is down around 96% from it's IPO price of Rs 400. Similarly Nagarjuna Constructions is down more than 90% from it's high of 400 in 2007. This year itself some of his stock has cracked more than 70% leaving a Rs 1000 crore hole in his portfolio. So next time if RJ buys something think twice before jumping on to it. I also hold some of the stocks like VIP, NCC & Delta.